FIFA 19 adds a few refinements to the systems introduced over the last few years. 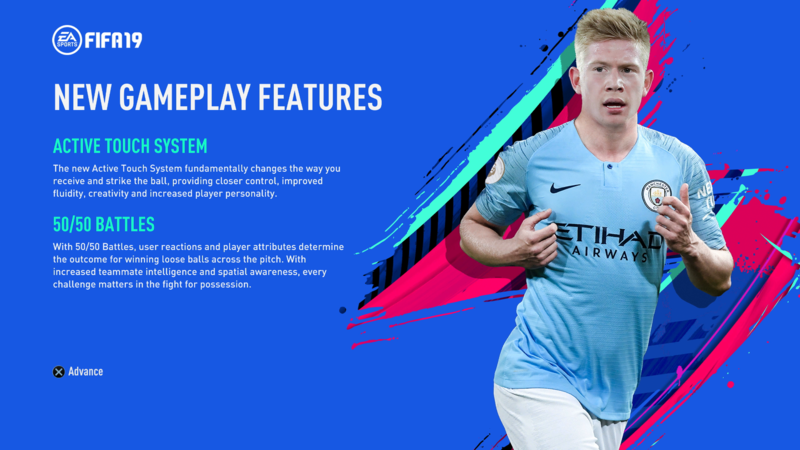 There are also plenty of new features, making FIFA 19 one of the best feeling entries in the series so far. With all of the new tweaks to the tried and tested formula, you'll want to get back into the groove as quickly as possible. To help you out, we've put together this FIFA 19 Guides Hub. It's where we'll collect all of our FIFA 19 Guides Content. From essential tips and tricks, to a look at the very best players in the game, we've got you covered. We've been busy pulling together guides on just about every spect of FIFA 19. You can find eveything that we've got so far in the list below. You'll find best young players, FUT 19, FIFA 19 The Journey, FIFA 19 Career Mode and more. Who Are the Best Players in FIFA 19? Below are our guides on key areas related to FIFA 19 gameplay. We’ll teach you how to defend, score goals and perform goal celebrations, and give tips on setting up an overpowered team. FIFA 19 PC Specs - What PC is Needed to Run FIFA 19? Here we’ve listed all of our FUT 19 Guides. They cover everything from Chemistry, to how to earn FIFA Coins Quickly and Easily. FIFA 19 Ultimate Team Chemistry Guide. The Journey is back in abig way in FIFA 19. Not only does it let you play as Danny and Kim in addition to Alex, it is also the conclusion to the story first started in FIFA 17. There's still major choices and key decisions to make, as well as hidden objectives to complete and awesome rewards to earn. Check out all of our FIFA 19 The Journey Champions Guides below. We’ve pulled together a list of the essential FIFA 19 tips you need to know. They cover everything from getting to grips with the new gameplay features, to goal scoring techniques and tactics. Learn how to use Timed Finishing - The new Timed Finishing shot is mapped to the double tap shot input, it has three levels of success indicated by the color of your player icon on release. Timed Finishing is perfect for shots outside the box, and adds a little bit more power behind the ball. Driven Shot - The Driven Shot is still an absolute beast. This year, it’s mapped to L1 + R1 + Shoot, and if you charge it up it’s pretty much a guaranteed goal at close range. This should be your go to shot for one on one situations, and is extremely useful for volleys as well. Ground Cross - When playing against another person, use the ground cross (double press cross) to fool your opponent. Most of the time, your opponent will be expecting you to loft a cross in from up high, so ground crosses can be a great way to mix things up. Use Tactics - FIFA 19 has the deepest tactics options in the series yet. Even if you don’t want to get to granular, heading into the dynamic tactics menu before a game and tweaking to your play style can make a huge difference. Quick Tactics - Similarly, while playing a game, make sure to actually use the quick tactics. Up, Up - One of the most useful tactics in FIFA 19 is pressing Up twice on the d-pad while attacking. This will get players into the box, and can make a real difference when crossing the ball. Turn the difficulty up - If you want to get better at FIFa 19 then we recommend having the difficulty at Professional. It’ll regularly take you out of your comfort zone and make Career Mode a whole lot easier. Learn how to switch players with the right stick - While your instinct might be to hit L1 or LB to switch player in FIFA 19, you might want to get acquainted with the right analog stick instead. You see, using L1 only switches you to the player nearest to the ball. This isn't always the best tact to use, as flicking the stick towards the player you wish to switch to is much better, and gives you a lot more options. Get your set pieces down to a T - Getting a corner or free kick in FIFA 19 is a great opportunity to score an easy goal, if you know what you're doing that is. We reccomend heading into the appropriate training drills and getting your perfecting your technique. There's some handy tips on scoring corners in our FIFA 19 Goalscoring guide. Use L2/LT for first touches - to avoid any heavy touches and loss of possession when receiving the ball, use L2/LT to keep the ball close.